*Note: The above links to Amazon, Book Depository, and Booksamillion.com are affiliate links. Affiliate links support giveaways for Somewhere Only We Know readers. Goodreads description--How could a loving God send people to hell? Will people have a chance after they die to believe in Jesus and go to heaven? I've had Erasing Hell in my possession for quite some time, but considering the topic I've put off reading it. Who wants to read about hell? I really didn't. But Husband and I have been talking about how there is a general lack of the fear of the Lord in our country lately it seems, and how it would do us both good to spend some time dwelling on this subject. What better subject to instill some Godly fear than hell? And so thus I decided it was time to pick this one up. 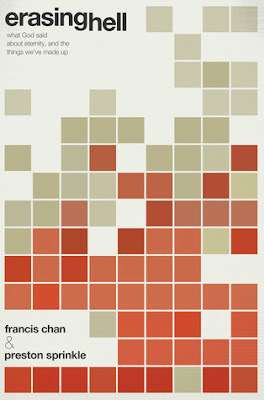 Francis Chan...wow. He certainly has a way with words. In all of the books I've read by him, I'm always impressed with his ability to be honest with himself, honest with his readers, and honest with God. He's not afraid to put himself and his short-comings out there on display in order to learn something about himself and in order to use that as an example to teach others. It's really impressive. Francis Chan & Preston Sprinkle admit upfront that truthfully they do not want to believe in hell as a real place. They don't want to think about people that they know and love possibly ending up there after this life is over. But they don't stop at what they wants to believe. No, they move into the Scripture and search it for what God says about hell and about eternity. What was really impressed upon me while reading Erasing Hell was how much this subject is dependent upon a proper understanding of God. The authors do a great job of showcasing God's character and nature throughout this scary and unpopular topic. While the first several chapters truly focus on the Scripture surrounding the topic of hell, the last two chapters had the most impact upon me. These chapters focused on some difficult questions concerning God and how we interpret God with our limited human minds. These chapters forced me to be honest with myself about how I think I have a right to determine what is right, and just, and loving. Erasing Hell really does dwell on some tough subjects, but as the authors say and is listed in the description above, "We cannot afford to be wrong on this issue." I highly recommend this book to anyone who is undecided on this topic, to anyone who needs a look at the deeper nature and character of God, to anyone who needs a good dose of the fear of the LORD. To well...anyone. Please note that of the other books by Francis Chan that I've read, Erasing Hell seems to be the most academic in nature. The authors obviously put a lot of research into this topic, but truthfully, you need to be willing to do some research on your own, specifically from the Bible, to form your own beliefs from God's Word. Erasing Hell gets a good 4.5 stars from me. Have you read Erasing Hell? If so, what did you think? Let me know! This review was first posted on Somewhere Only We Know. *Note: The above links to Amazon, Book Depository, and Booksamillionc.com are affiliate links. Affiliate links support giveaways for Somewhere Only We Know readers. Goodreads description--Children need love. Parents need respect. It is as simple and complex as that! When frustrated with an unresponsive child, a parent doesn't declare, "You don't love me." Instead the parent asserts, "You are being disrespectful right now." A parent needs to feel respected, especially during conflicts. When upset a child does not whine, "You don't respect me." Instead, a child pouts, "You don't love me." A child needs to feel loved, especially during disputes. But here's the rub: An unloved child (or teen) negatively reacts in a way that feels disrespectful to a parent. A disrespected parent negatively reacts in a way that feels unloving to the child. This dynamic gives birth to the FAMILY CRAZY CYCLE. So how is one to break out of this cycle? Best-selling author Emerson Eggerichs has studied the family dynamic for more than 30 years, having his Ph.D. in Child and Family Ecology. As a senior pastor for nearly two decades, Eggerichs builds on a foundation of strong biblical principles, walking the reader through an entirely new way to approach the family dynamic. For instance, God reveals ways to defuse the craziness with our children from preschooler to teen, plus how to motivate them to obey and how to deal with them when they don't. In the Bible, God has spoken specifically to parents on how to parent. This book is about that revelation. I’m not a parent yet, so I might have a skewed perception of this book. Husband and I do plan to try to expand our family in the near future, so that combined with how much I enjoyed Love & Respect (about the husband and wife relationship) made Love & Respect in the Family a perfect choice for me. As with Love & Respect, some of these principles discussed in this book are obvious, but the way Dr. Eggerich spells it out makes so much sense and clarifies a lot. Dr. Eggerich points out that when a parent and child get into it you never hear a child say, “you don’t respect me,” and you usually don’t hear a parent say, “you don’t love me.” No. The child says, “you don’t love me,” while the parent replies, “you’re being disrespectful.” This was such a revelation for me--and SO true! Dr. Eggerich even follows it up with another obvious point—it is the parent’s job to be the mature one in these "Family Crazy Cycle" situations. The parent is the one who has years of experience on the child. The parent is the one who should be mature enough not to lower themselves to the antics of children. This makes so much sense to me as to why parents and children have the strained relationships that they sometimes have—the parents never grew up. They never matured. They are still selfish and self-centered creatures who haven’t learned that they have to take the high road in order to avoid the "Family Crazy Cycle" that Dr. Eggerich discusses. Truthfully I should have written this review the day I completely the book. I feel like I’ve forgotten so much of the wonderful text already, which indicates to me that this is a book that I will need to read more than once. Dr. Eggerich does a good job showing you how to exit the "Family Crazy Cycle" and some great parenting advice that is indeed extremely applicable. And he does it in a way that both shows his own parenting successes and failures. He’s the first to admit that he and his wife did not parent perfectly—as no one can. He’s not arrogant with his advice and forceful in saying “this is what you must do in order to be a good parent.” Yet his advice is both Biblically based and common sense. Love & Respect in the Family is another book that I think every person ought to read. If you are a parent, if you had a parent, if you ever plan to be a parent. 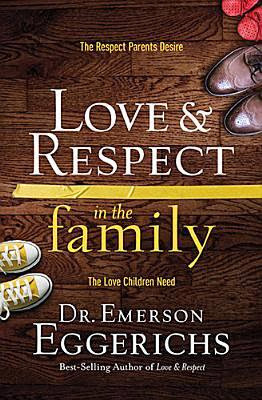 Love & Respect in the Family is broken down into easy to understand concepts that will make a big impact on your family if put into practice. Not being a parent myself, there were a couple of things that I wonder about, but time will tell for me. I’m giving Love & Respect in the Family an easy 4 stars. My only negative was that I thought the book felt complete at about the 75% mark. While the remaining portion still held valuable information, I felt it was time to wrap things up. Have you read Love & Respect in the Family? What did you think? Let me know! This review first appeared on Somewhere Only We Know.